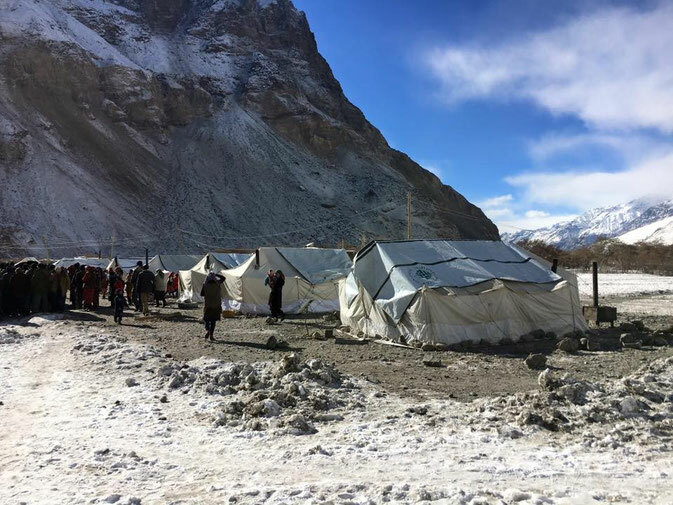 due to sparse media coverage of the incident in Western media, you may be not aware that on Monday, 7th of December 2015 the Pamir Mountains have been hit by a severe earthquake with a magnitude of 7.2 on the Richter scale. The epicentre was directly next to Sarez lake, which is why the Bartang valley has been affected strongest by the damages. Fortunately there have been “only” three casualties and only a hand full of people injured to a stronger degree. However in several villages nearly all houses have become uninhabitable. This is particularly dramatic as now in winter temperatures may fall to -30°C (= -22°F) and less. 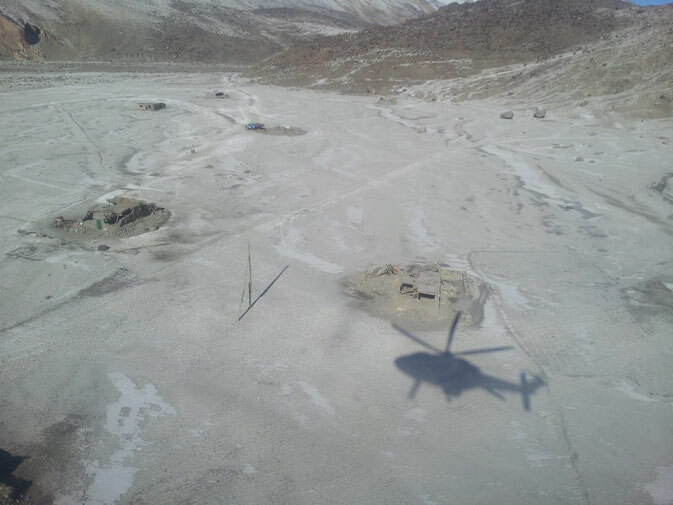 As the roads in Bartang valley have been also strongly damaged and current weather conditions do not allow helicopters to fly, it is still difficult to provide humanitarian aid for these remote places [Update 12.12.2015: Yesterday first helicopters have reached the upper villages and distributed first humanitarian aid and evacuated the injured]. It would be a great help for the people in Bartang valley if they could be the beneficiaries of your this year’s Christmas donation! 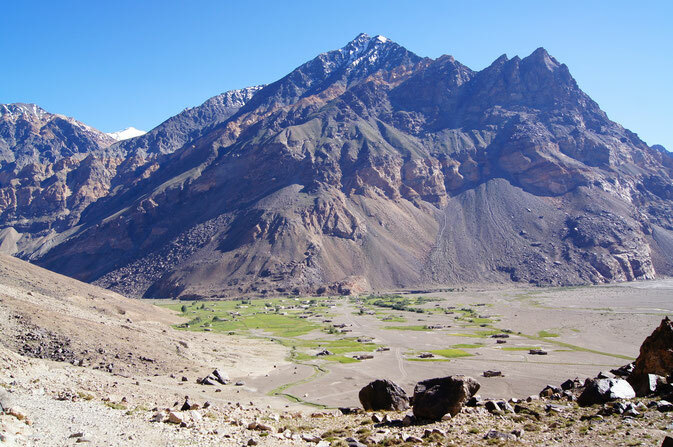 Thanks to our direct contacts into the valley, Bartang-has-a-Future and Pamir-Hilfe e.V. will (in cooperation) direct your aid straightly to those who need it most, without losses due to bureaucracy. If you need further information for transfer, please contact us. It would be great if you could forward a link to this website to your family, friends and colleagues and animate them to donate (and further forward the link) as well. Follow this link to a blog with the most recent information about the quake and aid campaigns. Below you find more detailed general information, a videos and some photographs. The video was shot during the first visit of high government officials to Upper Bartang after the quake (shortening and subtitles: Ryan Bastian). The GoFundMe campaign that is mentioned in the subtitles as well is distinct from our campaign; however of course we deem them also as worthy of support. ﻿The Video was made in Barchidev, one of the less affected villages. Still, the clouds of dusts indicating rockfalls on all mountain flanks impressingly demonstrate the destructive power of the quake. 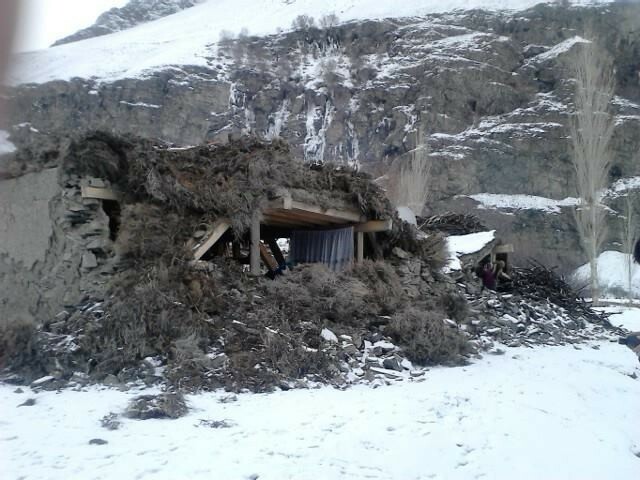 Destroyed Pamir-house in Nisur. Just the solid traditional roof construction has remained. 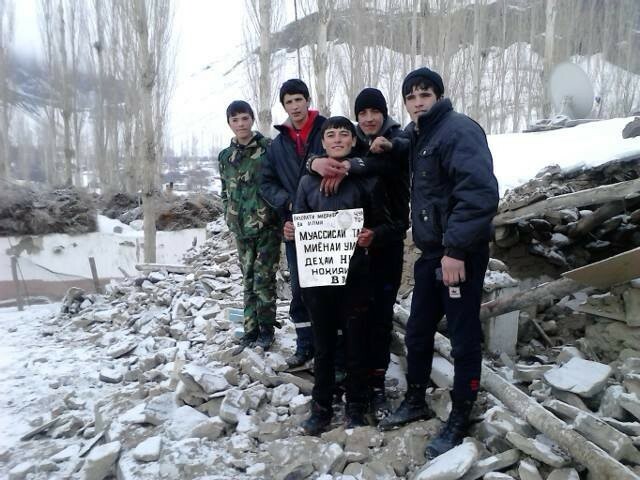 Students of Nisur with the former sign of their completely destroyed school building. Nisur village in better days, before it was damaged by the earthquake. Ghudara -aerial shot of destroyed houses. Ghudara consists of more than 50 household which are widely dispersed on a plain. Ghudara before its destruction by the earthquake. First picture of Ghudara after the quake. Tents have been set up as emergency shelters. Outside temperature at the moment: -8 °C. More pictures to come. 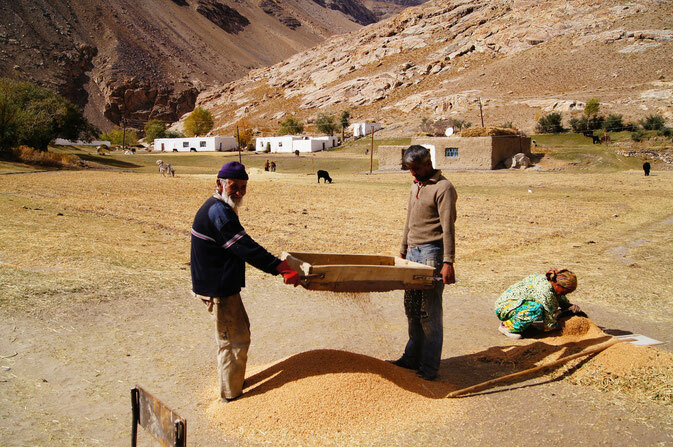 Inhabitants of Pasor processing their grain harvest manually. Their villages has been destroyed by 50 %. Ghudara, the last village of the valley, has been most severely affected by the quake. There, around 90 % of the houses have been totally destroyed. At the moment, the people there live densely in the few available tents. Furthermore they have difficulties to access their food storages that are covered by collapsed walls. That exactly Ghudara has been hit that terribly is a tragic irony of history: The ancestors of the present-day inhabitants had in past time been settling in Sarez, the eponymous village that borrowed its name to the Sarez lake. Sarez village – once the most prosperous and fertile village of the whole valley – sank in the floods after a comparably strong earthquake in 1911 had caused a whole mountain flank to collapse and form the world’s most massive natural dam, which in turn created the 56 km long lake (See here for a picture). 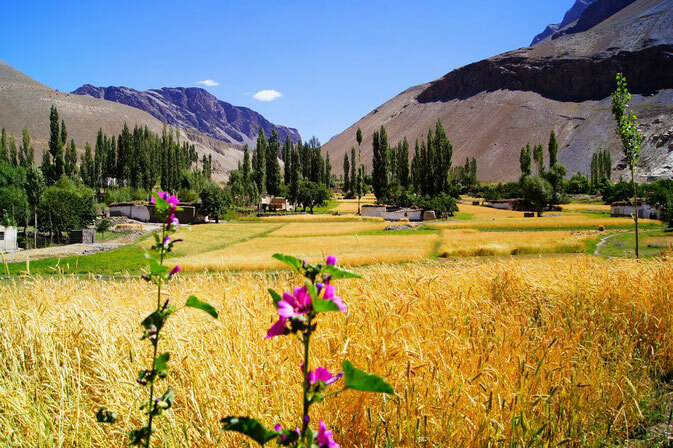 A big portion of the population of Sarez resettled to the Upper end of the Bartang valley, made the sparse land there arable and founded the village of Ghudara – which has now again been nearly wiped out by an earthquake. Further strongly affected villages are Wirinjawn (the five houses that had been left in this small settlement have all been destroyed), Pasor (with around 50% of its houses destroyed), Rukhch (around 20 % destroyed houses) and Nisur (circa 15 % destroyed houses). In Roshorv, Yapshorv, Savnob, Barchidev and Bopasor around 3-5 houses have been strongly damaged. 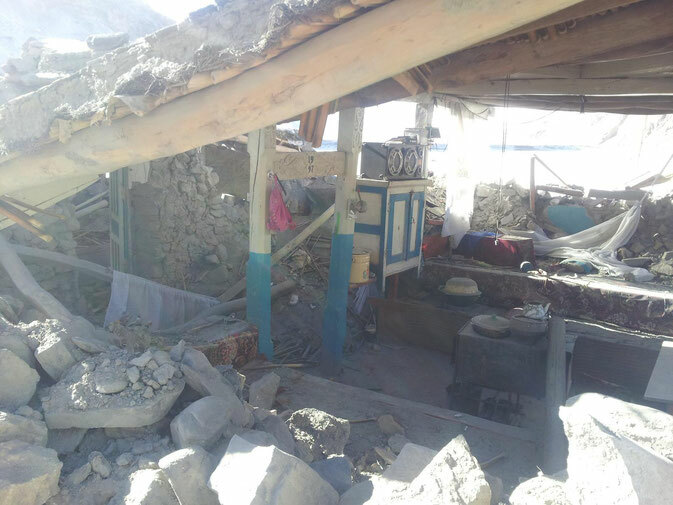 Furthermore in Basid in middle Bartang most houses have been severely damaged and around nine houses covered completely by a rockfall. In several villages, schoolbuildings have been damaged and in future students will most likely have to be sent to boarding schools. The Bartang road has collapsed at several places, particularly between Basid and Yapshorv, between Savnob and Rukhch and between Aktash and Karakul. Of course, Sarez lake receives particular attention in these days. The big question is: Has the dam been damaged by the quake? In case it would break, a big wave would roll down the Bartang-, Panj- and Amu Darya valley till the Aral sea and wipe out the settlement area of around 5 million people. So far no particularly alarming damage to the dam has been discovered, whereas, however, some sources say that the water level in the lake has risen and the outflux has doubled. Unfortunately, the seismological surveillance station on the dam has been destroyed as well. The inhabitants of those villages which have been comparatively little affected demonstrate an unprecedented solidarity with their neighbouring villages, having immediately accepted small children of the destroyed households and offering to the remaining inhabitants that they may spend the winter in their village, together with all their flock. Only when spring has come one can think seriously about rebuilding the destroyed villages. The central institution of civil protection in Tajikistan as well as the NGO Focus (which is part of the Aga Khan Development Network) are going to deliver humanitarian aid into the now isolated Upper Bartang valley as soon as weather conditions allow the helicopter to fly (fortunately at least Basid can still be reached on road). The objective of our campaign is to complement the humanitarian first aid measures of the Tajik government and other organizations. With the help of our Bartang-based friends we are going to identify where our help is needed most urgently. Mainly, however, we want to support the Bartangi in the medium-term (for example in the organization of provisional winter accommodations) and on the long run (in the reconstruction of infrastructure and housing). Of course we will also not loose sight of our traditional “core-project”, the lobbying for a sustainable electrification of Upper Bartang. The perspective for an electrification could prove crucial in this moment, in order to provide an incentive to the inhabitants of the destroyed villages not to leave their appreciated homeland forever.